Regulation, economic issues, and practice differences slow contrast-enhanced ultrasound adoption in the United States. Contrast-enhanced ultrasound (CEUS) is augmenting sonography imaging around the world, but not as much in the United States. With FDA approval for the use of contrast limited to echocardiography, physicians and radiologists here are turning to "off-label" uses to come up with clearer views of more than just a patient's heart. "It is legal to inject these agents intravenously, whether it's per the FDA-approved use or an off-label use," says Wui Chong, MD, chief of diagnostic ultrasound and an associate professor of radiology with the University of North Carolina School of Medicine in Chapel Hill. "When the agent enters the circulation it goes into every organ of the body. The difference between Europe and here is that in the United States we only place the probe over the heart. In Europe the probe is placed over the liver, kidneys, and many other organs as well." Contrast ultrasound is widely used in Europe, Asia, and Canada, and is being introduced in areas of South America. In those locations, contrast is used with ultrasound to examine not only the heart but also conditions of the liver, abdomen, and gastrointestinal system. The scope of use is different in the United States. Currently, the FDA has approved three contrast agents for echocardiography: Lantheus Medical Imaging's Definity, GE Healthcare's Optison, and Bracco Diagnostics' Lumason (sold internationally as SonoVue). These contrast agents have been deemed safe and useful in obtaining a better view of the heart's left ventricle. Optison was the first agent approved by the FDA, in 1997. However, some physicians also see benefits for viewing other parts of the body and are adopting off-label CEUS uses similar to those in use in other countries. In FDA information regarding off-label and investigative use of marketed drugs and devices, "the physicians use legally available drugs and devices according to their best knowledge and judgment. If the physician uses a product for an indication not in the approved labeling, they have the responsibility to be well informed about the product, to base its use on firm scientific rationale and on sound medical evidence, and to maintain records of the product's use and effect." Ultrasound contrast uses gas-filled microbubbles to improve the reflective nature of blood and thus improve the visualization and assessment of cardiac cavities, vessels, and tissue vascularity. When injected into patients, these microbubbles flow through the circulatory system, enhancing the reflectivity of the sonographic images. Using CEUS requires the addition of contrast-specific software on the ultrasound equipment that suppresses the signal from the background tissue, leaving only the signal from the microbubbles. The issue in using CEUS for more than echocardiography is as much a financial debate as it is a discussion about medical efficiency, Chong says. Without FDA approval, there are no CPT codes and without a code there is no reimbursement for using contrast with ultrasound, limiting reimbursement to the already approved echocardiography. "It's more of an economic issue," Chong says. "Without FDA approval of contrast ultrasound imaging of organs other than the heart, its use will be limited. 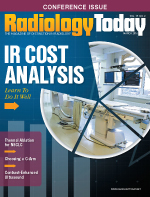 The lack of reimbursement is what's holding back advancement of contrast-enhanced ultrasound." Chong says that in some cases, hospitals in the United States have turned to alternative funding methods, such as grants or large donations, to cover costs for off-label uses of ultrasound with contrast agents. In the end, however, it's a matter of weighing benefits against risks, as well as considering costs in a health care cost-conscious environment. But even with a CPT code, some radiologists believe that it will take more of an overall acceptance of the benefits of CEUS among their peers and hospital administrators to see this practiced more prevalently in the United States. "Having a CPT code would facilitate the use of contrast-enhanced ultrasound but it wouldn't completely replace the financial questions regarding its use," says Kassa Darge, MD, PhD, chief of the division of body imaging in the department of radiology at The Children's Hospital of Philadelphia (CHOP). Darge spent 20 years studying and working in Germany before coming to CHOP, and brings with him examples of how the radiology culture in the United States is different from that of Europe, particularly when it comes to who is involved in the ultrasound process. Radiologist Richard G. Barr, MD, PhD, with Radiology Consultants, Inc in Youngstown, Ohio, describes a typical liver ultrasound scan. In the United States, skilled technologists conduct the exams in much the same way with each patient. With some exceptions, radiologists view images after the exams have been performed; they're not involved in the imaging process. By comparison, CEUS is a more dynamic exam that depends on the technique of the sonographer and requires active participation of someone administering the contrast. Therefore, CEUS requires more investment of time to perform and interpret the exam than a noncontrast ultrasound. "You need a second person in the room for the procedure, one to inject the contrast and one to perform the scan," Barr says. By comparison, Darge says that radiologists in Europe take a more hands-on approach to ultrasound in general and even more so with CEUS. "In Europe, there is also more point-of-care ultrasound done by nonradiologists, who can perform the scan and make determinations at that time," Darge says. "They want to maximize the diagnostic aspect of ultrasound for their purpose, so they would use ultrasound with contrast." Even if a sonographer performs the exam, there also needs to be an additional person in the room to inject the contrast, Darge says. This can be done by the radiologist or vice versa. There's also the matter of which imaging modality, with or without contrast, is best for the condition under study. Barr uses CEUS off label for imaging of abdominal disease and renal masses. He says that CT and MRI with contrast are frequently used off label with less concern than CEUS, while ultrasound is often considered the safer option for the patient. "It's clear that there are certain off-label applications where contrast-enhanced ultrasound can really help patients," Barr says. "For example, patients in renal failure cannot undergo MRI due to the adverse effects of the contrast dye. Urologists I've spoken with say the contrast-enhanced ultrasound gives them a better answer than other modalities. In addition, they can use multiple doses of the ultrasound contrast and can see results in real time, which is particularly helpful when performing biopsies." Barr also says that CEUS provides a clearer picture of what's wrong within the abdomen or organs like the liver or kidney. In a patient with liver focal nodular hyperplasia, for example, MRI and CT can show conflicting results. "MRI and CT are snapshots, where with ultrasound, you're looking at a continuous enhanced pattern," he says. "You can see everything regarding enhancement over time in the liver. Referring doctors know that MRI and CT fail to give them a clear answer." Darge says that in Europe there is a greater effort to maximize the use of ultrasound exams, especially with children, than he has experienced in the United States. He believes some of that has to do with the fact that radiologists in Europe receive intensive hands-on ultrasound training and they are primarily responsible for performing the exams. It is not common to find sonographers doing ultrasound examinations. "In the United States, we often go right from ultrasound to another modality when trying to diagnose a medical condition," he says. "In Europe, they try to maximize the use of ultrasound more frequently. The access to MRI may be limited as compared to the United States, too." The changing structure of health care reimbursement may prove a factor. If more of the American health system shifts from fee-for-service care toward value-based reimbursement, the cost savings of CEUS may seem more attractive to providers than other higher-cost and higher-reimbursing modalities. "In a system that is fee-for-service based, that's an issue when you're considering whether to use ultrasound with contrast or MRI," Darge says. "However, the indications and frequency of pediatric ultrasound with contrast have much less of this issue. In Europe, with a different payment [structure], this may not be of relevance." There's also the matter of reducing radiation dose, especially with pediatric patients. Darge says that the European Union has had level guidelines for radiation dose that encourage the use of nonradiation-dependent modalities, such as ultrasound, much earlier than in the United States. "The push to reduce radiation dose with kids in the United States came later than in Europe, with the Image Gently Campaign," Darge says. Safety profiles for all sizes and ages of patients are factors for consideration when determining the best imaging modality with contrast. Medical physicist J. Brian Fowlkes, PhD, a professor of radiology with the University of Michigan Health System in Ann Arbor, notes that using CEUS is a good alternative for patients who don't want the ionizing radiation exposure of a CT exam with contrast or cannot undergo MRI due to implanted devices or, in the case of patients in renal failure, who cannot tolerate MRI contrast. Ultrasound with contrast hasn't come without its own safety controversies. Some concern regarding the use of CEUS stemmed from a small number of adverse reactions, all self-reported, in the late 1990s among patients who were undergoing echocardiography with contrast. In 2007, the FDA issued a black box warning for the two contrast agents available at that time, DEFINITY and Optison, noting concern especially when used with severely ill patients. The agency backed off those warnings one year later, saying that benefits from the diagnostic information gathered through the use of CEUS outweighed the risks. "When the FDA issued the original black box warnings, there was a reaction in the cardiac community, and use of CEUS declined," Fowlkes says. "The labeling placed restrictions on some very important clinical applications, but as the truth evolved, those restrictions were reduced as the safety profile for the agents became clear. Through analysis of safety studies, it was determined that those original complications were not an issue." Barr explains that the dose of contrast used off label is the same as that used for cardiac purposes. "Because the FDA has approved the contrast agent for cardiac use, and the dose used for off-label procedures is the same, safety isn't an issue," Barr says. "But the FDA wants to see a paper that shows efficacy. There are plenty of studies in Europe and Asia but they want to see studies of US patients. They don't look at the body of evidence from outside the United States." As debate continues regarding the use of CEUS in the United States, professional organizations like the American Institute of Ultrasound in Medicine and the International Contrast Ultrasound Society, are working to help further acceptance of CEUS, whether for off-label use or for approval of agents by the FDA for uses other than cardiac. They recommend guidelines for safety and equipment use, as well as speak to the safety of CEUS. With all the discussion surrounding CEUS Barr says there is a perception that it cannot be used off-label. "You need a motivated person in your radiology department for more widespread adoption," he says. "We've been saying for 20 years that contrast-enhanced ultrasound needs to be used beyond cardiology," Chong adds. "It's a matter of taking a familiar agent and extending its indication to other areas. We need to convince the FDA of this in hopes of gaining approval and creating a CPT code." — Kathy Hardy is a freelance writer based in Phoenixville, Pennsylvania. She is a frequent contributor to Radiology Today.